Secretary of State Kerry's "peace process" actually put Israelis and Palestinians on a new collision course. Not a single Palestinian Authority official has denounced the wave of terror attacks on Israel. They, too, are afraid of being condemned by their people for denouncing "heroic operations" such as ramming a car into a three-month old infant. Kerry and other Western leaders do not want to understand that Abbas is not authorized to make any concessions for peace with Israel. For Abbas, it is more convenient to be criticized by the U.S. and Israel than to be denounced by his own people. Ignoring these facts, Kerry tried to pressure Abbas into making concessions that would have turned the Palestinian Authority president into a "traitor" in the eyes of his people. Abbas knows that the people he has radicalized would turn against him if he dared to speak out against the killing of Jews. The recent spate of terror attacks in Jerusalem, Tel Aviv and the West Bank did not come as a surprise to those who have been following the ongoing incitement campaign waged by Palestinians against Israel. This campaign escalated immediately after U.S. Secretary of State John Kerry's last failed "peace process" between Israel and the Palestinians. Kerry's "peace process" actually put Israelis and Palestinians on a new collision course, which reached its peak with the recent terror attacks on Israelis. Kerry failed to acknowledge that Palestinian Authority [PA] President Mahmoud Abbas does not have a mandate from his people to negotiate, let alone sign, any agreement with Israel. Abbas is now in the tenth year of his four-year term in office. Nor did Kerry listen to the advice of those who warned him and his aides that Abbas would not be able to implement any agreement with Israel on the ground. Abbas cannot even visit his private house in the Hamas-controlled Gaza Strip, and he controls less than 40% of the West Bank. Where exactly did Kerry expect Abbas to implement any agreement with Israel? In the city-center of Ramallah or Nablus? What Kerry and other Western leaders do not want to understand is that Abbas is not authorized to make any concessions for peace with Israel, and has even repeatedly promised his people that he would not make any concessions for the sake of peace with Israel. In a speech in Ramallah on November 11, marking the tenth anniversary of the death of his predecessor, Yasser Arafat, Abbas declared: "He who surrenders one grain of the soil of Palestine and Jerusalem is not one of us." This statement alone should be enough for Kerry and Western leaders to realize that it would be impossible to ask Abbas to make any concessions. Like Arafat, Abbas has become hostage to his own rhetoric. How can Abbas be expected to accept any deal that does not include 100% of his demands -- in this instance, all territory captured by Israel in 1967? Abbas himself knows that if he comes back with 97% or 98% of his demands, his people will either spit in is face or kill him, after accusing him of being a "defeatist" and "relinquishing Palestinian rights." This is precisely why Abbas chose to walk out of Kerry's nine-month "peace process." Realizing that Israel was not going to offer him 100% of his demands, Abbas preferred to abandon the peace talks last summer. For Abbas, it is more convenient to be criticized by the U.S. and Israel than to be denounced by his own people for achieving a bad deal with Israel. Ignoring these facts, Kerry tried to pressure Abbas into making concessions that would have turned the Palestinian Authority president into a "traitor" in the eyes of his people. Instead of being honest with his people and telling them that peace requires painful concessions also on the part of Palestinians, and not only Israel, Abbas has chosen -- ever since the collapse of Kerry's "peace process" -- to incite Palestinians against Israel. Abbas has since held Israel responsible for the collapse of Kerry's effort. Abbas has used both the media and fiery rhetoric to tell his people that there is no peace partner in Israel. He has also been telling his people that Israel's only goal is to seize lands and carry out "ethnic cleansing" and "genocide" against Palestinians. Abbas's recent charges that Jewish settlers and extremists are "contaminating" the Al-Aqsa Mosque in Jerusalem need to be seen in the context of the massive incitement campaign that escalated in the aftermath of the failure of Kerry's "peace process." During the past few months, Abbas, Hamas and Islamic Jihad have radicalized Palestinians to a point where it has become laughable even to talk about any peace process with Israel. Abbas is well aware that his people will condemn him if he ever returns to the negotiating table with Israel. That is why he has now chosen a different strategy -- to try to impose a solution with the help of the United Nations and the international community. Abbas wants the international community and UN Security Council to give him what Israel cannot and will not offer him at the negotiating table. The incitement campaign against Israel is reminiscent of the atmosphere that prevailed in the West Bank and Gaza Strip immediately after the botched Camp David summit in the summer of 2000. Then, Yasser Arafat also walked away from the table after realizing that Israel was not offering him all that he was asking for, namely a full withdrawal to the pre-1967 lines. Upon his return from Camp David, Arafat also unleashed a wave of incitement against Israel; eventually the incitement led to the eruption of the second intifada in September 2000. Now Abbas is following in the footsteps of Arafat by stepping up his rhetorical attacks on Israel. This time, Hamas and other terror groups have joined Abbas's incitement campaign by openly calling on Palestinians to use cars and knives to kill Jews in order to "defend" the Al-Aqsa Mosque. Abbas's refusal to condemn the recent terror attacks on Israel may be attributed to two motives: fear of his people, and the belief that violence will force Israel to make far-reaching concessions. By refusing to denounce the attacks, and even praising the perpetrators as heroes and martyrs (as he did in the case of Mu'taz Hijazi, the east Jerusalem man who shot and wounded Jewish activist Rabbi Yehuda Glick), Abbas is indicating his tacit approval of the violence. Not a single Palestinian Authority official, in fact, has denounced the wave of terror attacks on Israel. They, too, are afraid of being condemned by their people for denouncing "heroic operations" such as the stabbing murder of a 26-year-old woman or ramming a car into a three-month-old infant. Victims of what official Palestinian Authority media organs call "heroic operations": Left, Dalia Lamkus, 26, run over and then stabbed to death by a terrorist on Nov. 10. 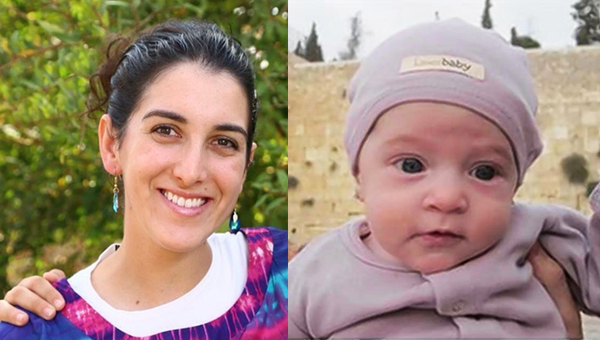 Right: Three-month-old Chaya Zissel Braun, murdered on Oct. 23 when a terrorist rammed a car into her stroller. Several other victims were killed or injured in these attacks. Abbas is hoping that the terror attacks will keep the Israeli-Palestinian conflict at the top of the world's agenda at a time when all eyes are turned toward the threat of the Islamic State terror group in Syria and Iraq. He also knows very well that the people he has radicalized would turn against him if he dared to speak out against the killing of Jews. The statement that Palestinian Authority (PA) president Mahmoud Abbas is working to keep the Israeli-Palestinian conflict at the top of the world's agenda is more on target than most people realize. The whole Israeli-Palestinian conflict and peace process is being used by Muslim leaders to maintain blame and condemnation on Israel explicitly, and the Western civilization of Europe and the Americas implicitly, by the international community and the United Nations; so that the United Nations and the international community will always be against Israel, Europe and the Americas; or at the very least the United Nations will not be used for the Americas, Europe and Israel. This is because Muslim leaders consider the United Nations to be another Western Christian crusade and rather than wait for Western Christian armies to move against Islam, they have decided to take the offensive and bring jihad against the West, including turning the United Nations against the West. They both figured out and discovered that condemnation and blame of Israel was the best way to turn the international community and the United Nations against the United States and NATO, the dominant Western power. With the UN and international community putting its stamp of approval on condemnation and blame of Israel, Islamic jihad and Sharia law are represented as peaceful and promoting of human rights to the world in replacement of Western Christian crusade and government. The West has unwittingly been going along with being supplanted by Islam because they have been tricked by the UN's condemnation and blame of Israel that Islam has accepted the Western designed broad construction of the UN charter for human rights, when in fact Muslim jihadists have been using the broad construction of the UN charter for human rights to infiltrate Western civilization for the purpose of destroying the West. Very insightful article. I'm going to save it and send a copy to our next president. Erekat, the Palestinian negotiator, was fired for making concessions to Israel during the peace process. He's was allowed back because he promised not to do it again. You can imagine how successful the talks will be if one side is not allowed to make concessions. Kerry is learning that making the history books is not as easy as he thought. European media was transfixed by the Kurds defending Kobani, and lots of coverage on why not an independent Kurdistan, and then the Gaza reconstruction conference drew media back to Jerusalem. Perhaps it was a coincidence that Abbas needed to get the media once again transfixed, so why not incitement that pressures the Hashemite Kingdom over the Temple Mount? Although I agree with everything said here, there is another aspect of Abbas that casts doubt on the "peace process" - his "mandate" rests almost entirely, not on being president of the Palestinian Authority, which expired long ago, but on his being the leader of Fatah and the PLO. As the leader of Fatah and the PLO, accepting any form of peace treaty with Israel would mean the end of Fatah's raison d'être, something which he isn't powerful enough to do. It would also put him at odds with Hamas, whose charter vows to never make actual "peace" with Israel, except in the form of temporary ceasefires, as laid out by Islam, to regroup and prepare for the next round of fighting. On a political level, he's astute enough to realize that he couldn't deliver on any agreement. And on a more pragmatic level, he's also at the apex of one of the most massive extortion rackets in history - he and the rest of the Palestinian "leadership", have pocketed billions of dollars from running a huge, lucrative "protection scheme". Even if he could be convinced, personally, to give that up, there's no way that he could convince any of the other crooks to put an end to the gravy train. without addressing any of this, the obama/kerry "piece plan" is nothing more than a futile exercise to squeeze one-sided concessions out of israel. it won't fly because it cannot. Saddam Hussein knew that the only way to stop terrorists and assassinations was to put the fear of God into them. For the terrorist who killed the young woman and the baby, he would have totally wiped out his family tree. Kerry is a total phoney with a phoney war record. He knows almost nothing about diplomacy or how the middle east countries operate. I enjoy reading Carl's comments as I feel he knows what he is talking about. As far as Kerry, he is a man just filling in a position. I do not believe he knows what he is talking about. I do not trust his opinions or decisions as I do not feel he is capable. Abbas helped build the box he is now trapped in. A culture built on hate and fed a diet of intolerance has no room for compromise. Any attempt at compromise will be met by a radicalized population that would only serve to undermine any Palestinian leader that dared speak of peace. Today, the more radical the Palestinian leader, the more popular he becomes within the Palestinian population. So, the rooster has come home to roost. While Kerry diddles to Obama's fiddle, the reality of a Palestinian state has never been more of an unreality than it is today. Does the Gatestone Institute maintain a staff of "liaison" officers to meet with officials at the US State Dept, and the White House? It is probably wishful thinking; however, I would hope that such an effort might actually pay off in terms of educating those who sorely need educating. Cowards kill innocent children, women and men for no reason. The fact that the Palestinian leaders and a large part of the population celebrate terrorists who drive their cars into babies and stab women on the street as heroes tells you how hopeless the situation really is. 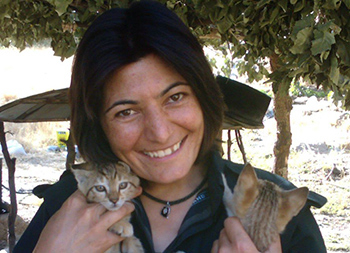 Where are the demonstrations in Europe for Dalia or Chaya? I guess we will have to wait until the Israelis destroy the house of one of these terrorists in retribution for the European and Western outcry. What's a dead Israeli baby compared to a demolished terrorist house? Priorities people. And so the cycle continues. No one wins. Abbas is telling his people that Israel's only goal is to seize lands and carry out "ethnic cleansing" and "genocide" against Palestinians. But facing this, his people has all legitimacy to have the goal to seize all the lands (Israel) and to carry out "ethnic cleansing" and "genocide" against the Jews. He probably think that the time has come after all those years he brainwashed his population, children and adults, men and women of all ages that the Jews must be killed to get the Last Judgment of God. But the Last Judgment is supposed to fall upon the people who will raise against Jerusalem. Unfortunately Abbas and the Palestinians are again choosing death instead of life. This time it will be much more pain full than at the time of the 2nd Intifada, because the Jews will not accept the wave of terror of 2000-2003. Enough is enough. I thought that only the PLO is empowered to negotiate internationally - that the PA has internal affairs in the territories and something to say about details of boundaries. Of course, the fact that Abbas is both overstayed PA-president and chairman of the PLO makes things very confusing. Might a separate PLO chairman help to create legitimacy for a a call to at least calming down? Historically, hatred of Jews has been rewarded, not punished. It always has been the all-purpose, sure-fire way to achieve acceptance and to gather followers. Every nation has done it, and with the possible exception of Germany, none even has admitted its anti-Jewish behavior, let alone apologized. So, the United Nations will fault Israel for existing, and American ambassadors will search for a "cemetery peace" (a peace in which all Jews are in the cemetery), and even some Jews will press for "honest negotiations" with haters. And just as the war between Islam and Christianity has persisted for thirteen hundred years, so will the war against Jews persist. All actions by Israel should be based on the absolute fact that there never has been, and never will be, peace for Jews. Eliminate false hope, and plan for reality. And our Secretary of State is apparently so eager to stuff a peace deal (any kind) down the Israeli's throats that he lets an old fox like Abbas make a fool of him. As long as Western nations are prepared to ignore the immorality of Abbas et. al. and pretend it's just a matter of getting a few more concessions out of Israel, there is little hope for peace. What's the difference between murdering an infant in her carriage and executing a hostage in the desert? NONE! I wonder why this analysis of the stalled peace negotiations is so difficult to be accepted by the world at large. It's so obvious. A major error. The Palestinians don't want 100% of that territory captured in 1967. They want 100% of the land from the Jordan to the sea. That is their minimal demand, not their maximal. Just open your ears. "How can Abbas be expected to accept any deal that does not include 100% of his demands -- in this instance, all territory captured by Israel in 1967?" Isn't the Palestinian Arabs demand for a Palestine "from the river to the sea"? When did that change?